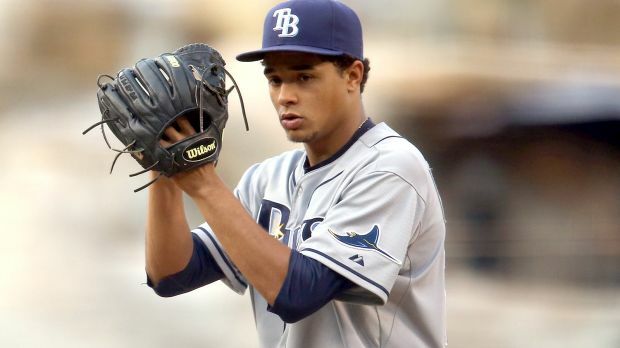 Last night, the 2015 All-Star Chris Archer took the mound against the Houston Astros. Archer was so dominant and showed why he should be considered a Cy Young candidate this year. Archer threw a complete game shutout and in that shutout he struck out 11 Astros (link) and walked one while giving up only 1 hit. The walk was to Jose Altuve on four straight balls in the bottom of the first. He gave up the single to Colby Rasmus in the 5th inning. Archer was in command of everyone of his pitches. He was using that electrifying 95 to 97 mph fastball to set up his nasty slider or devastating changeup. As for all of that the Rays won 1-0 and Archer was the biggest reason why they won. Archer was just on his game and that is what an ace’s outing should look like. The defense helped out too. Archer after the game improved his stats to 205 K’s, 2.77 ERA with a 11-9 record in 169 innings of work. Archer is currently 3rd in baseball in strikeouts with 205. He is behind Clayton Kershaw and Chris Sale. Kershaw has 212 K’s and Sale has 208 K’s. Archer can still win the strikeout title. Archer is striking out at least 10 to 11 batters per start. Archer is the 4th Rays pitcher to ever join the elite list of punching out 200 batters in a season. He joins Rays legends James Shields, David Price, and Scott Kazmir. Also, the lone run was driven in by outfielder Desmond Jennings. Jennings was the offense last night. He went 2-for-4 at the plate and added a RBI to his night. Forsythe scored on Jennings single (link). Jennings went 6-for-13 when he first returned from the long and boring 60 day disabled list. Desmond entered yesterday’s game 0-for-7 and ended that skid by getting two solid hits in the game.